Adorable Handwritten Script Font is a modern and elegant handwritten font with a wide and right-slanted touch that makes it natural and pleasant. It’s characteristic hand look style makes it perfect to use for logos, signatures, labels, packaging design, blog headlines or simply use it in your next design project. 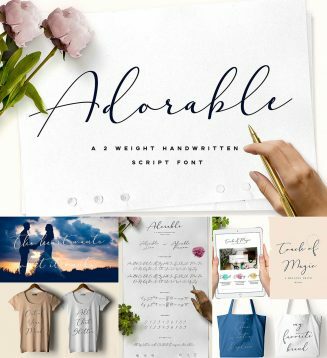 Tags: adorable, calligraphy script, cursive, handwritten font, ink, love font, pretty font, script, typography.